Species faces threats from cover type conversion and altered grazing and fire regimes, and although populations in the core of their breeding range in northeast Montana appear to be relatively stable, declines are occurring in much of the species' global breeding range. CommentGrassland habitats have been heavily impacted since European arrival and species has probably declined by 25-50% over this time period. CommentBreeding Bird Survey (BBS) data for Montana is of moderate credibility and shows an insignificant trend of -0.8% decrease per year or 2% decrease per decade. Saskatchewan and Alberta show moderate credibility significant declines of around 10% per year or -91% per decade. Trends on North Valley County Point Counts between 2001 and 2008 showed a 2% per year increase in the percent of points the species was detected on and a 9% per year increase in the number of birds. ScoreB - Moderate and imminent threat. Threat is moderate to severe and imminent for a significant proportion (20-60%) of the population or area. CommentPlowing, use of pesticides, and control of fires probably represent the biggest threats to the species. Species breeding range is drastically reduced and local abundances within current breeding range are probably lower than in historic range probably due to loss of buffalo and natural fire regime and plowing of native prairie. Species is dependent on grazing and fire as natural disturbance regimes that create their preferred short grass habitat. 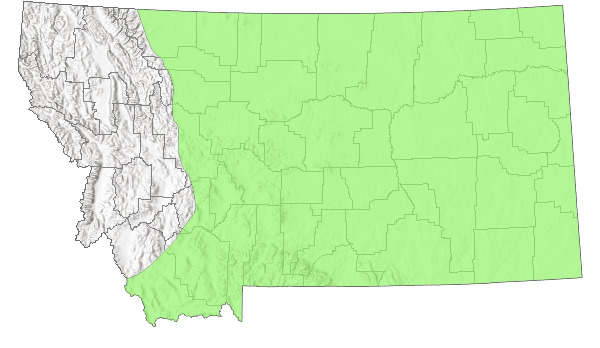 SeverityModerate - Major reduction of species population or long-term degradation or reduction of habitat in Montana, requiring 50-100 years for recovery. CommentSpecies seems capable of responding quickly to restored disturbances, but sod busting seems to be a long term challenge for recovery. CommentUncertain if 20% of grassland habitats would be lost in next 15 years, but species experts agree that the species faces threats across large portion of range. ScoreB - Narrow. Specialist. Specific habitat(s) or other abiotic and/or biotic factors (see above) are used or required by the Element, but these key requirements are common and within the generalized range of the species within the area of interest. CommentNarrow specialist. Dependent on shortgrass prairie (grass height of <12 inches with < 8 inches probably ideal for nesting). A chunky, sparrow-sized bird about 15 cm in length with a short tail and large bill. The name “longspur” references an elongated claw on the hallux (hind toe). The breeding male is gray with a black bill, crown, malar stripe, and upper breast; a blackish wash on lower breast and belly; and chestnut median coverts. The breeding female, also gray but without the black plumage of males, has a pale bill; median coverts and scapulars have a rusty tinge (With 2010). Identification of breeding males is straightforward, as their combination of plumage characters is unique among North American passerines; however, females, non-breeding males, and immatures are drab and less easily distinguished. McCown’s are most likely to be confused with Chestnut-collared Longspurs, but have larger, paler bills (often with a darkish tip) and longer wing projections. In all plumages, tail pattern (extensive white with inverted black “T”) can be used to distinguish McCown’s from other longspurs, though this may be difficult in the field (With 2010). Migrates in large flocks between breeding grounds in the Canadian Prairie Provinces and northwestern Great Plains and wintering grounds in the southwestern United States, Texas, and northern Mexico (With 2010). In the Bozeman area, normal migration periods are from April 25-May 10, and September 10-October 1. Semi-arid shortgrass steppe, characteristically open with sparse vegetation, provides nesting habitat; so do structurally similar habitats like overgrazed pastures (With 2010). Forages by day, eating primarily grass and forb seeds, insects, and other arthropods (With 2010). During the breeding season, males establish territories and maintain them by characteristic aerial displays (With 2010). Monogamous; pairs appear to form once males have established territories. Nests constructed in shallow ground depressions. Two broods possible per season (With 2010). Statewide, the species nests from May 9 through July. Decreasing range-wide abundance can likely be attributed in large part to conversion of short-grass prairie to agriculture and urban development. Although grazing may actually benefit McCown’s Longspur, it has been subject to other habitat disruptions like plowing, pesticide use, and suppression of grassland fires that maintain shortgrass prairie (With 2010). Felske, B.E. 1971. The population dynamics and productivity of McCown's longspurs at Matador, Saskatchewan. MS Thesis, Univ. of Sask, Saskatoon, Canada. 133 pp. Greer, R.D. and S.H. Anderson. 1989. Relationships between population demography of McCown's longspurs and habitat resources. Condor 91: 609-619. Lenard, S. and P. Hendricks. 2005. Birds of selected grassland and riparian plots along the Rocky Mountain Front. Montana Natural Heritage Program for US Fish and Wildlife Service and The Nature Conservancy. 17pp + maps. Saunders, A. A. 1912. A horseback trip across Montana. Condor 14:215-220. TRC Environmental Corporation. 2009. Results of the 2008 grassland bird displacement study at the Judith Gap wind energy project, Wheatland County, Montana. Judith Gap Energy LLC. Chicago, IL. 24 pp + appendices. 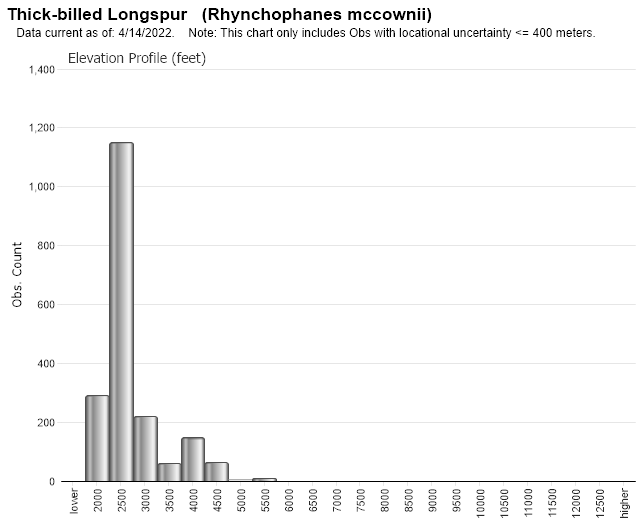 Web Search Engines for Articles on "McCown's Longspur"